A tattoo parlour is giving all funds raised from a special paw tattoo to a local dog shelter to help rescue animals. 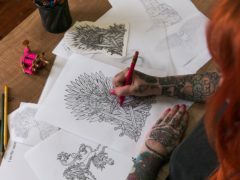 Game Of Thrones fans are being offered the chance to get a free tattoo themed around the hit TV show. A tattoo studio has helped raise more than £4,000 for a woman’s cancer treatment. Tattoos release microscopic pigment particles that lodge in the lymph nodes, posing a potential health risk, research has shown. Do you have a dodgy tattoo that really needs covered up?